Is the Dead Sea in terminal decline? The Dead Sea is located in the Jordan rift valley with a Jordanian border to the east and borders with Israel and Palestine to the west, and it has the lowest land elevation on Earth at over 400 metres below sea level. Technically the Dead Sea isn’t a sea at all, it’s a hypersaline lake; the freshwater inflows from the Jordan River, and its associated tributaries, come into the land-locked Dead Sea where some of the water evaporates. This increases the waters salinity, it’s about nine and half times saltier than the ocean, and famously means people can happily float on it simply through natural buoyancy. Despite having a surface area of almost four hundred square miles the Dead Sea is estimated to be shrinking at around one metre per year. Water levels have declined by approximately 30 metres since 1960 through to a combination increased usage and extraction upstream in the River Jordan, and a reduction in rainfall. Dead Sea imagery from Landsat 5 in 1984 on the left, and Landsat 8 in 2014 on the right. Data courtesy of USGS. 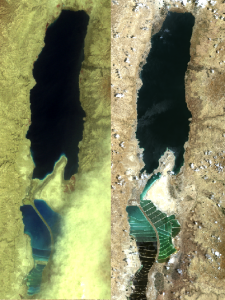 The changing shape of the Dead Sea can be seen in the Landsat image shown on the right which were both taken in the May/June period, but 30 years apart, the first in 1984 and the second in 2014. The shows a reduction in surface area alongside the development of evaporation ponds in the south that are maintained by pumping water from the northern basin – the Al-Lisān peninsula splits the sea into two unequal basins with northern basin being significantly larger and deeper. We also wondered if the recent 2014 image shows spontaneous crystallization in the surface waters, as described by Steinhorn in 1983. Could be worth further investigation? A talk at the recent EARSeL conference also highlighted the problem of sink holes around the Dead Sea. Sink holes are being caused by the interaction of freshwater with subterranean salt layers; as the water level drops, salt is left behind in the soil and when freshwater washes through the soil the salts dissolve and cavities are created. Eventually, the subterranean structure loses integrity and sinkholes are formed. It’s estimates that there are around 3,000 sink holes in the Dead Sea region, but more worryingly a new sink hole opens up almost every single day! The Dead Sea is one of the natural wonders of the world, and yet it’s slowing dying through shrinkage and sink holes. Remote sensing is a great monitoring tool for natural resources, but something needs to be done on ground if these images aren’t to become a modern day death mask. This entry was posted in Earth Observation, Landsat, Research, Space Can Help, visualisation and tagged Dead Sea, decline, Earth Observation, Landsat, pixalytics, remote sensing, shrinkage, sink holes, spontaneous crystallization by Andy. Bookmark the permalink.